Users of Google+ are quickly coming to the conclusion that one of the game changing features offered up by this new social network is the following and sharing filter called Circles. For those that have not yet wandered into G+, you can segment those you follow into groups (circles) with the idea that this gives you the ability to share selectively – business contacts get business stuff, family and friends get pictures of cats doing funny things, etc. One of the things that is plain to see, even in just a week of exploring G+, the world of online users have learned a great deal more about how to use social networks than just 3 or so years ago when we all jumped into Twitter. Instead of blindly building followings people seem to be using the Circles tool specifically as a way to meter the stream of information and perhaps focus on smaller numbers in an attempt to limit the eventual overwhelm and uselessness that comes with large unfocused followings. In a way G+ is acting as a bit of a do over for the early business users of Facebook that now find it harder to keep business and personal separate. This is by no means a proclamation that Facebook is dead, I’m simply finding in the early stages of G+ that people are using G+ in a way that differs from some other networks. That too will likely evolve. Because the act of creating circles and then determining who goes where is so central to G+ it presents an opportunity to address the thinking process that goes into how we analyze these circles. I for one think it illustrates one of the most profound changes in social network use. Instead of simply categorizing the default sounding demographic type circles such as family, acquaintances and coworkers, I’m seeing a move towards circles that consist of a focus on content – or what you expect to hear and how you expect to interact with members of a circle being the guiding light. While Google Plus suggests some generic names for your first circles you are free to create and name as many as you like (there may be a limit, but not aware of one). 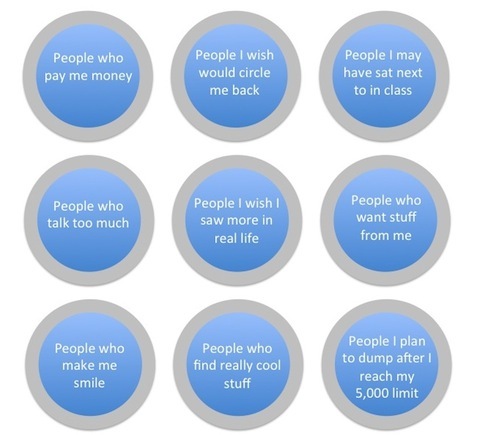 The image in this post was my attempt (humorous or not) to illustrate how I believe people are really thinking about their circles. I first published this image on G+ and it was shared over 1000 times by users, so I think others are sensing this and feeling this and struggling with this as well. If you’ll allow me to get a little geeky here, this to me is the exciting part of the world we live in today – not that we have this new, new thing to go on about, but that change, evolution and growth are all organic parts of the social web and what may seem valid or not today will surely change as more and more people come to grips with practical uses for each new member of the parade of tools.